The Cattle Market Luncheon Bar. 1930s. This was originally Pie Orr’s founded by pastry baker William Orr in 1889. Over the years these licensed premises have enlarged and the name above the door has also changed from William Orr’s to the Cattle Market Bar, Luncheon Bar and the Grove. 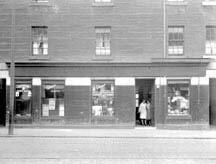 In 1889 William Orr took over the old and historic restaurant at 467 Gallowgate. Situated near the meat market and Bellgrove Street, this was once the best place in the east end of the city to dine and have a drink. William Orr named his new restaurant come pub the “Cattle Market Luncheon Bar”, he decorated his place with flowers, casks, bottles, crystal and richly framed pictures. 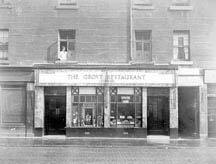 The restaurant was unique in the east end as it was the only establishment where the business was a licensed house and a restaurant combined. Mr Orr had a reputation for his excellent pie’s, 50 dozen pies where served over the counter on a Saturday, locals soon adopted a name for the place “Pie Orr’s” a name that stuck for almost 70 years. William was assisted with his wife and daughters. Coffee, tea and pastry was supplied at all hours. A large room was set aside for wedding parties. The name changed to the Grove restaurant when the meat market moved to Duke Street, Houston’s furniture store expanded and took over the restaurant in the late 1950s. William Orr’s premises was pushed further east, Houston’s expanded even further and finally took over all the neighbouring shop. There haves been pastry bakers trading on the site of Pie Orr’s since as early as 1847.